Cruelty and neglect of companion animals is a common problem in Vietnam. Many pets do not live longer than a year or two without being stolen, sold, or dying of infectious disease or from car accidents while roaming on the streets. Much of the abuse people see we see is not necessarily intentional, but is often from ambivalence towards their feelings and from people seeing animals as being for food, protecting the home, or catching rats. On the other hand, we see so many loving pet owners who simply do not know much about pet care or are lacking in the supplies or vet care to properly treat their animals. Many of these pet owners still have their animals stolen or they die from disease or poor vet care and this is heartbreaking. In order to address the issues of animal cruelty in the long term, we have to also address the short term problems such as what to do with the victims of abuse. Sheltering is a necessary evil, and we have to acknowledge that some shelters must exist. These facilities must handle the intake of animals that require medical care from abuse and neglect and then can go through rehabilitation to be adopted or live out their lives at the shelters. These shelters must be managed by professionals in animal facility management who understand the need for infectious disease control, can handle intake and evaluation, and are able to care for animals who have been in abusive situations or require long term medical treatment. These professionals do not yet exist in Vietnam and without training programs and extensive funding operations, shelters will not be a viable option. It is important that not only do managers get training, but that local veterinarians are trained in handling these facilities and their needs for sterilization and disease control. There are no veterinarians at the moment outside of the Ho Chi Minh City and Hanoi who can handle these facilities. Without years of training and financial input, sheltering is a disaster in the making as we’ve seen again and again in local organizations in Vietnam. We are strongly against the building of more shelters in a country lacking the human resources and financial capacity to effectively care for the animals in them. 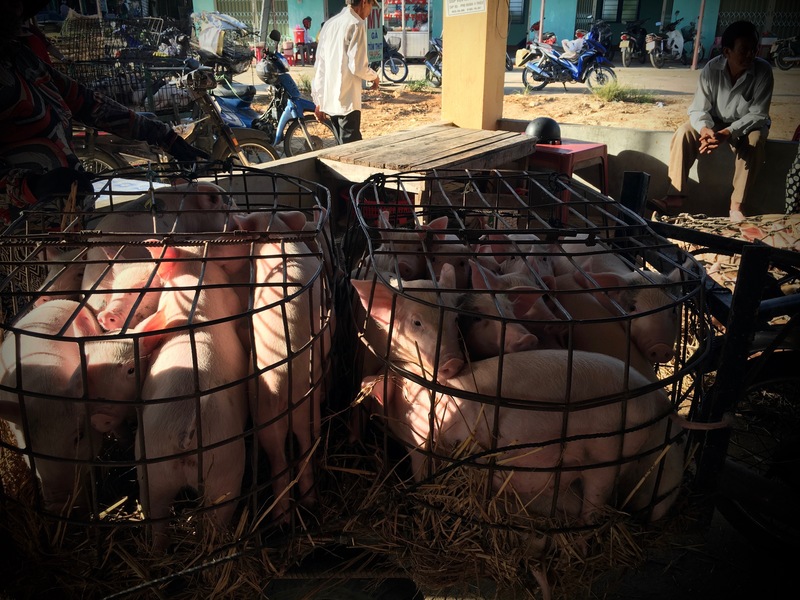 Enforceable legislation to protect animal rights is another option that we must pursue in Vietnam, both on a local level and a national level. Lobbying efforts from animal rights organizations should be strategic and done with the help of legal experts to create the most effective legal solution animal rights violations. This process will include many years of ongoing work. We must be understanding of the fact that international pressure has little effect in Vietnamese domestic policy and democratic methods of protest and lobbying are irrelevant. An effective political strategy for animal rights must take this into account. Protests, petitions, and international pressure mean little to the policy makers in Hanoi, so locally-produced lobbying efforts remain the most effective way to gain headway in this project. We support grassroots political efforts to make change. We have a rescue shelter and farm sanctuary that houses around 50 animals at any given time in our large, secure garden for the dogs and indoor/outdoor cat enclosure for the cats, pig, chickens, and ducks. The dogs are nearly all medical rehabilitation cases who we treat at the clinic and then take into the shelter for psychological recovery and to be adopted. The cats were taken mostly as kittens from markets and brought to us by tourists and locals. We recognize that the adult cats often have little chance of being adopted because so many people either want to adopt kittens or they find kittens on the street and take them if they want a cat. These cats will likely be with us for the rest of their lives so we make sure that we can provide them the best life possible in our indoor/outdoor cat enclosure where they are kept safe while being able to enjoy some nature. The farm animals are also with us for their whole lives and people who come to our education programs at the shelter are able to meet them. Our three stall barn houses 2 pigs currently and the birds live in the cat enclosure. We keep our numbers of rescues low in order to ensure that the animals in our care will always have the highest welfare possible and that we can have the time, money, and human and material resources to care for each and every one for as long as they are with us. The need for a rescue shelter far exceeds our capability to handle all the animals that come to us. We have no more intake now simply because we are too full. Until more are adopted, we have to turn away potential rescues for the sake of those we have already committed to. Our main purpose now with the rescue shelter and farm sanctuary is to use it as a home for dogs and cats waiting for their new homes as well as to use it for education programs for animal rights organizations, children, and veterinarians.